Machine-RAUM 2011 13 October - 27 November. MachineRAUM - a festival for video art and digital culture. 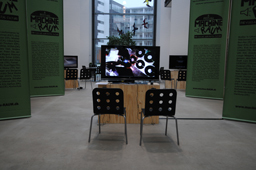 Machine-RAUM 2011, an International Festival of Video Art and Digital Culture. Machine RAUM's vision is to be a platform and meeting place for artists working with video and digital culture. the world where there is currently very great changes and where the balance of power is changing. 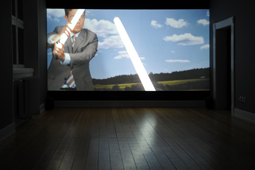 responsibility for a globalized future, and especially art may show alternative ways of looking at things. events in a historical kontext, showing the influence of time and put the events in relation to contemporary issues. 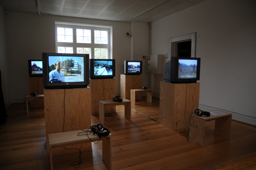 academies and the younger artists have their approach to media art. 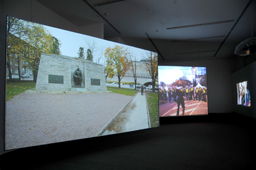 At Vejle Art Museum an exhibition took place with video, video installations and screenings. From top left: Emanuel Licha/ War Turist. Kristina Norman/ After War. 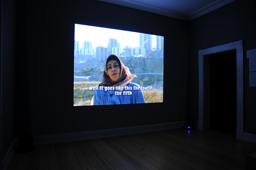 Adel Abidin/ Consumption of War. In the entrance hall sreeenings programs from the art academies. Below from the left CANAN: ibretnûma/ekemplary and still from Videoists screenings program. artist talks, and seminar with the invited curators Beral Madra from Turkey and Moataz Nasraldin from Egypt. Claus Ejner, sound og performance groups Krach Kisten Orchestra og SONA.